Magento 2 Mobile App Builder: Create fully native Android and iOS applications for your Magento 2 e-commerce store. These apps can be published on Google Play Store and Apple App Store with the real-time synchronization of products, categories, customers, orders, etc between webshop and mobile app. 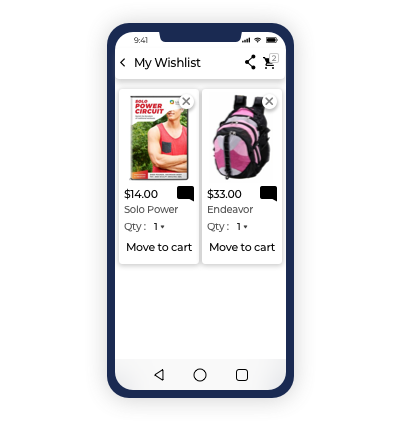 From the mobile app, a customer can browse products, place order, view order details, create new account, write reviews, move items to wishlist, and do much more. 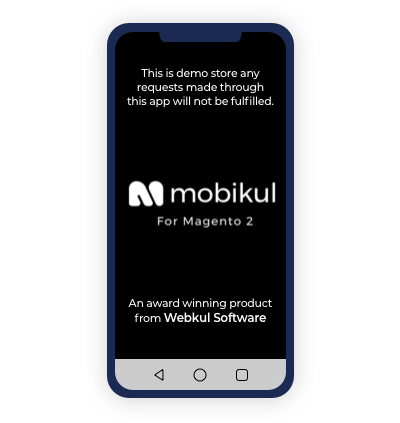 Magento 2 Mobile App has been chosen by Magento Innovations Lab Award for "Machine Learning Search"
Mobikul Mobile App Builder for Magento 2 - Mobikul, a product of Webkul, providing an effective solution to the app user to purchase the product on a Magneto 2 store easily. Magento 2 Mobile App Builder is a ready-made solution for building a customized app for your webstore. Further, you can integrate - Live Chat, Wallet System, Delivery Boy Tracking in your Magento 2 Mobile App. 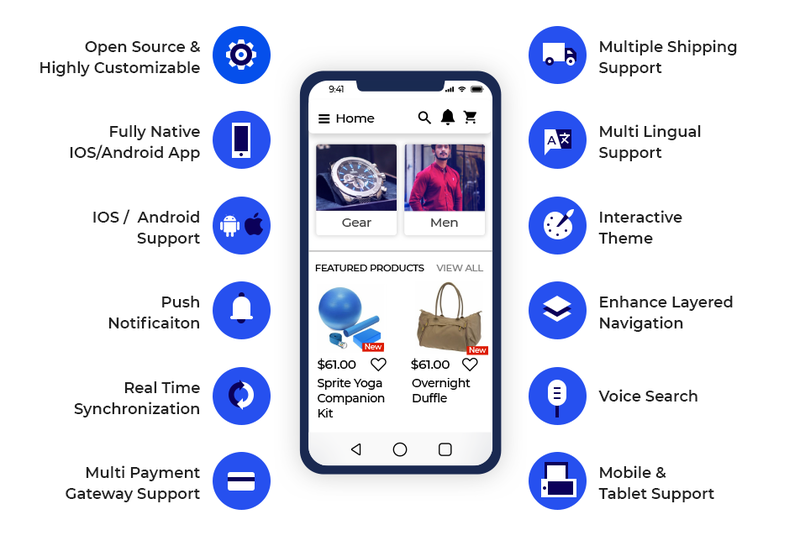 This will increase user engagement with the store, as merchants/sellers don't need to worry about the complex website, the customers can easily download the apps from the Google Play Store and Apple App Store, and shop for products using their smartphones and other devices. Mobikul Mobile App for Magneto 2 is a Fully Native Application. So it will be efficient in interaction with the device based features - barcode search, geolocation, voice search, fingerprint login, photo search, etc. The app is dedicated as per the operating system. The app’s features are very much similar to your existing Magento 2 webstore. With the help of REST API, all the customizations, features, functionalities available on Magento 2 store can also be replicated on the Mobile App via customization paid service. Further, mobile app source code is available for purchase. 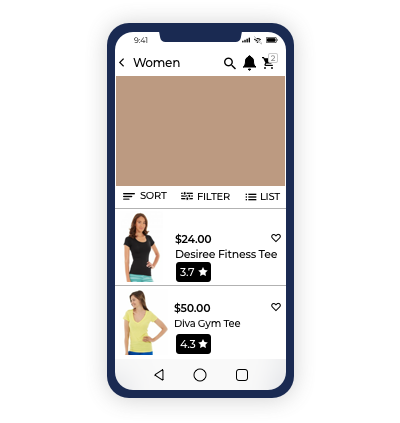 Magento 2 Mobile App is automatically synced real-time information with the web store to reflect the action on the app. So, it's time to advance your store with the mobile application! Why We Need a Mobile app? Full Utilisation of Device Based features. Simple product, Grouped product, Bundled product, Configurable product, Virtual product, and Downloadable product. The app has a set of the interactive banner, set of carousels- category carousel, featured product carousel, and new product carousel. The search result can be filtered via Layered Navigation of collection page. The app gives support to default Magneto 2 payment method- phone, cash on delivery, money order and personal cheque. 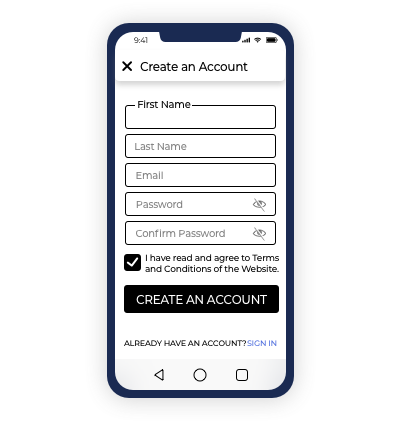 The app can be configured from the admin panel, with all the basic setting like a banner, notification, category icons and banner, and other sections. The app can be converted to the desired language. Just the language must be enabled on the store. Note- The app supports RTL layout for languages having RTL formats like Arabic, Persian, Hebrew, and others. 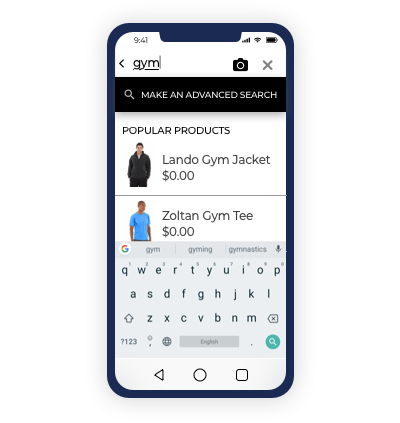 The app user can checkout with the product in a few steps, which makes the checkout process fast. Thus, increasing user engagement. Text Detection- Reads the text on an object via camera and show the related result in the app. Currently, the text detection works for English language only. Product(Object) Detection- This will detect the object via camera and through machine learning the result related to the object will be displayed to be selected by the user. This will help the user to search the product more efficiently. 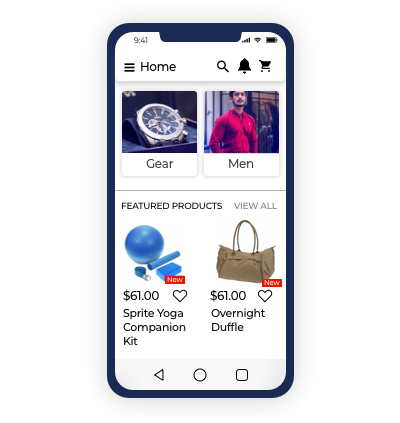 Category Carousel - The categories are displayed in the form of a horizontal carousel which can be seen on the top of the homepage of the app. Featured Product Carousel -The sliding carousel will have a collection of exclusive products. New Product Carousel - This will contain a set of product which has recently arrived on the store and is fresh on the store. Recently Viewed Product Carousel - This section is the most influential part as it contains all the products which the customer has seen in the past. It is said the number of times a product is visited the increment conversion rate is also prevalent. Banner slider - A sliding set of multiple banners are displayed to represent the information related to the store. The app user can search for the product is a very easy way. This could increase the user experience by decreasing the struggle of the customer to look for the desired product. Typing keyword - The user can simply type the special keyword and look for the desired product. 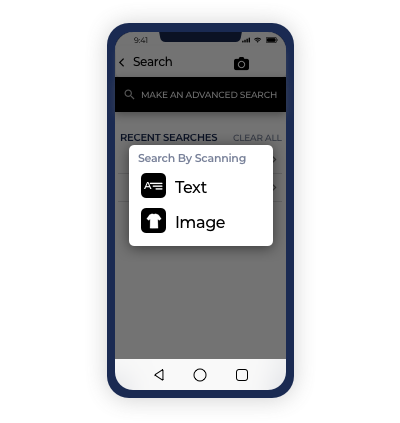 Voice Search - In this case, the app user will speak the desired keyword and through Voice Recognition the word is identified and finally it gets browsed in the complete app. Search via image - Here, the search is done by the image. The app learns about the desired product through- the image detection or text detection. After the machine learns it searches the product in the app. In this, the buyer can search the product based on their interest. 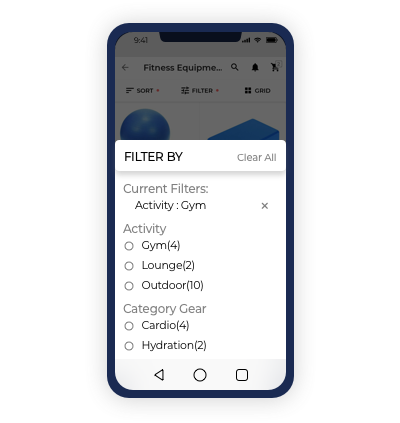 In the layered navigation, the customer can search any product by any attributes which are designated by the admin to be displayed on the front-end and filterable. It benefits the customer to narrow the search, according to the desired product. For eg. Shoes can be filtered by size, material, price, color etc. It benefits the customer to narrow the search according to the desired product. 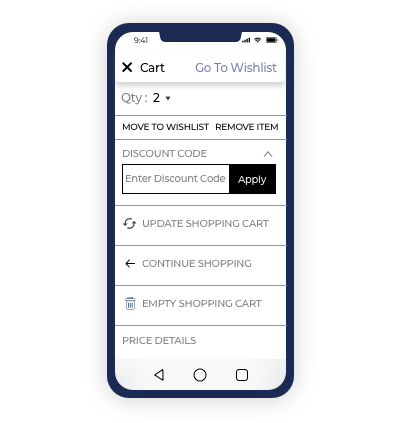 It will exhibit the products added by customers which they want to purchase, with product details, selected quantity and an option to add the product to cart or remove it from the wishlist. 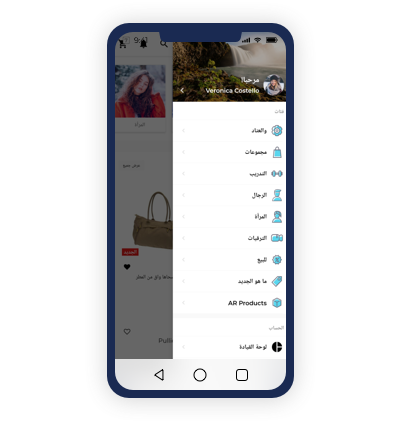 The app also provides a feature of Sharing the products or wishlist with your friends, and relatives through various platforms. Any note with regard to the product. Remove it from wishlist option. The application supports a wide range of payment gateways. 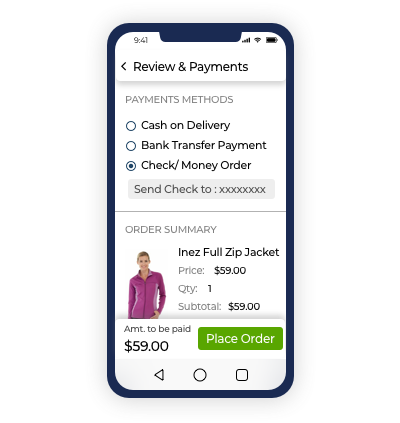 The payment extensions provide the unified and seamless payment experience for your customers while keeping your inventory and order data organized through one central platform. Also, have the following advantages which make your business flourish. Calculation of Taxes (Tax Rule) is based upon 3 mandatory fields- Customer Tax Class, Product Tax Class, and Tax Rate. Each customer is assigned to a particular Customer Class, similarly, each product will be associated with a particular Product Class (selected at the time of creation of the product). Magento2 calculates the Tax by matching these 3 areas, Tax Class of the product in the cart (Taxable Goods, Shipping goods etc. ), Tax Class of the Customer (Wholesaler, Retailer etc.) and the Location of the transaction taking place (which is set in the section “Manage Tax Zones and Rates” ) traced from Billing or Shipping Address. Internet connectivity issue is predominant in third world countries. This issue is well managed in Mobikul Mobile App where the customer can scroll through the complete app even when there is no internet. Here, the Pre-loaded pages(when internet connectivity is present), will get open even if the internet is not available. So if the customer is in moving state they can still visit your store and look out for various products. Can help in increment of sales as now the customer can review the store products in offline mode also. Removal of internet connectivity barrier. The Mobikul Apps ensures the app users data privacy and full control over the shared data. It doesn’t enforce the app user to bid by terms and conditions which they are not willing to. The EU has lead postulate to safeguard the data of their citizens which the app abides by. 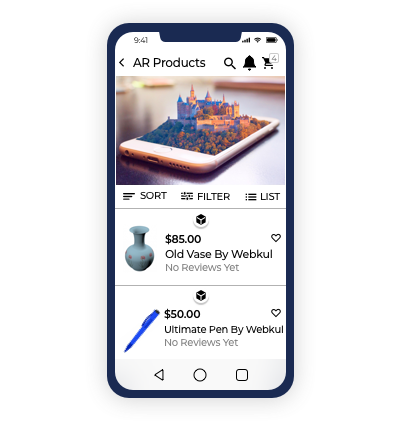 Webkul’s has effectively implemented the Machine Learning feature of product detection in its Mobikul App. 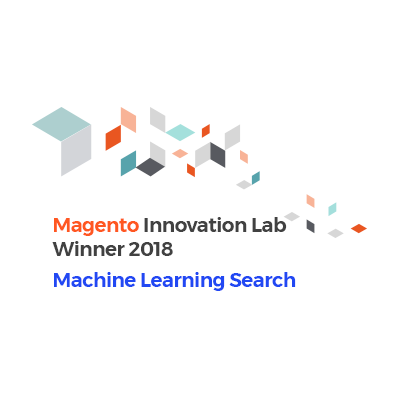 Following which we were awarded by the Magento Innovations Lab - 2018 as one of the most innovative ideas. The Mobile is now made more advanced and user interactive by the feature of Artificial Intelligence, where the objects in the real-world environment are augmented into computer-based information. Here, the surface is detected by the device and product is placed on that surface. The customer can see all this in AR mode on their device. The customer can have a clear image of the product being purchased. Helpful in the design industry, automobile industry, etc. The app user remains much connected with the store via this feature. Note- To know more about the feature, refer here - Mobikul Mobile App Builder for Magento 2 and AR (Augmented Reality). This is an additional feature of AI in the application. This allows the user to take in measurement visually. 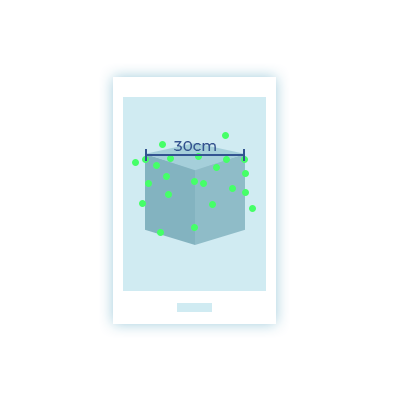 The app user can scan the product and a measurement gets recorded accordingly. Removes the requirement of any measurement device. Helpful in the design industry, automobile industry, and many other such places. Note-: For now we are having this feature in the iOS app only. To get an insight into this feature you can follow the link here. The Magento 2 mobile app provides easy support to the language written in RTL (Right-to-Left) format. That is, one can even see the app in Arabic, Persian, Hebrew, and other such languages. The app here not only supports the format but also the layout. This will allow the customer with RTL format to easily operate the app. Jomlah - Converting your simple website into an advanced mobile app can help in increasing sales to high gradients. The Magento 2 Mobile App Builder has helped Jomlah.com to generate more revenue by increasing the accessibility of the store via an app. The organization deals with multiple products to make your life easy. Now, with the introduction of a native app, it has made the process more convenient and friendly. Chase - With globalization in technology, the mobile apps have created a benchmark in the attracting maximum customer. 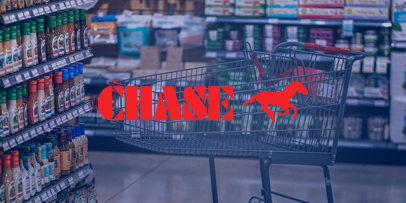 Following these words, Chase has converted its Magento based website to an app. Using which they have generated efficiently deal by selling deal grocery items. Their customer can now view best products, our monthly and seasonal deals and our bundle packages from an app without the requirement of visiting the store or any website. They can look and purchase the desired products from anywhere and anytime. 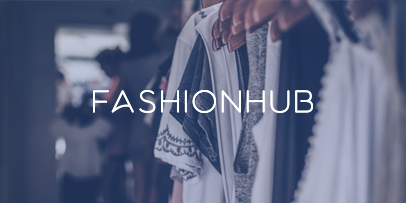 Fashion Hub - Another, name from the multiple lists of the satisfied client is the Fashion Hub. The store post-converting to an app could successfully attract the customer. With Magento 2 Mobile App, now they have easily popularized their design and collection. Thus, help in enhancing their customer experience. Did you buy Magento 2 Mobile App Builder? I have worked with mobikul to built our application on Android and iOS, and they did really very great job. They replay to my request very fast. They help me with account creation. And sure I will work with them for my app customization and for my next project. Thanks, so much I appreciate this app. it's a perfect mobile app for Magento 2. The support teams are really fast. Mobile Apps are very quickly integrated into our online store. When there are obstacles when developing, webkul can handle it well. Customization feature requests can easily be integrated by them. We feel like we have friends to discuss. Delivery time is more than perfect, support is almost instant I feel like I am in a live chat with the developers, thank you for your efforts looking forward to more collaboration, thank you.